A stirring of the inner fires of the psyche, quickening is also known as the process of coming to life. If I had but one word to sum up who I am, that one word would be quickening. Welcome to ~ Quickening ~ and all that it stands for. Journey along with me in the pursuit of the feminine mysteries and become at one with your true selves. Read updates on my blog here at Wyld Womyn. Awakening the Wild Woman within. 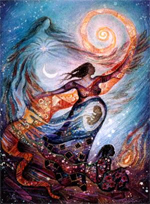 QSS - Professional childbirth educator and doula support for local women who wish guidance through the sacred women's mysteries of pregnancy and childbirth. Support from a Women's Collective. The DawnAge Project - an information resource for interpersonal relationships, including domestic & family violence, abuse, healthy relationship interactions and parenting with appropriate boundaries. This has been in development since mid 2009 and opened to known members in late 2010. An alternative to the medical monopoly on childbirth. Freebirth Australia - a resource for women exploring freebirth or unassisted childbirth as a valid birthing option for their own situation. Autonomy, self-responsibility and ownership of one's own life are themes which best suit freebirth, however there are women who come to this through other circumstances.